Annual Town Meeting | From the Seasonally Occupied Territories . 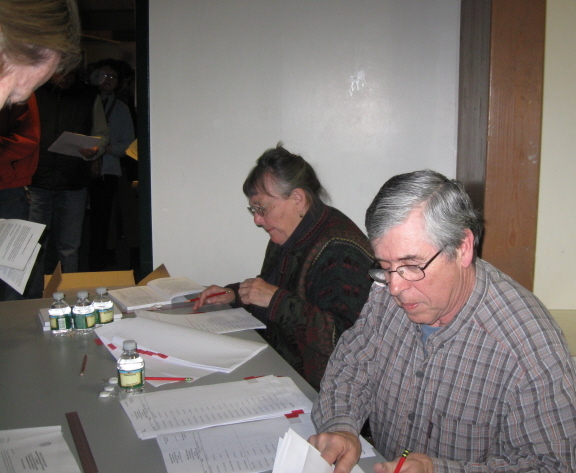 . .
West Tisbury voters check in. 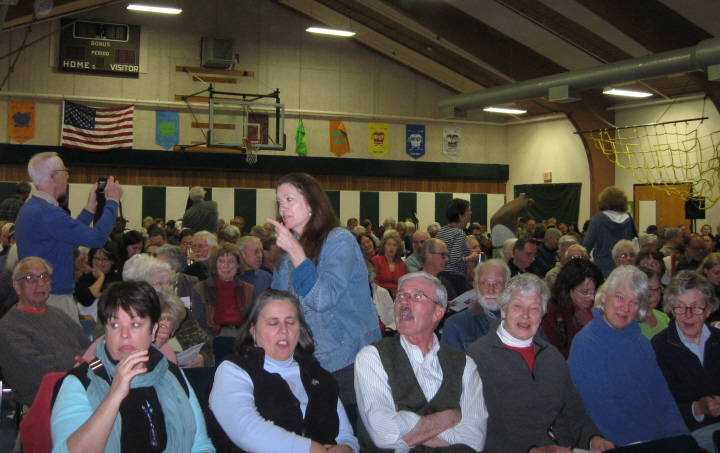 Last night was West Tisbury’s annual town meeting (ATM means more than automated teller machine around here). As usual the school gym was packed. Even with two entrances, each staffed by two people checking townsfolk against the voting rolls, we were still pouring in at 7:15 for a meeting that was supposed to start at 7:00. Ginny Jones and Tony Rezendes check us in. We don't even have to give our names: they know who we are. I had poured in uncharacteristically early. My excuse is that I live five minutes’ walk away from the school. This gave me time to kibitz with friends and grab a seat near the front. Outside, the Cape Light Compact people were passing out energy-efficient lightbulbs. After ascertaining that they were free, I took one. After the Pledge of Allegiance (which I didn’t say, even though it was led by a couple of adorable Cub Scouts), our poet laureate, Fan Ogilvie, read her poem about the Liberty Oak. If you ever drive down State Road, you know this tree and understand why people write poems about it. West Tisbury is probably unusual in having a poet laureate, but that’s the kind of town it is, or thinks it is, or thinks it wants to be. Quite a few decades back it changed the name of a road known as Cowplop Lane to Music Street. After that it’s no big step to laureate a poet or two. The late John Mayhew (left) at the rededication of the Veterans Memoral, Veterans Day 2011. Also honored on this occasion were Nelson Bryant and Clifton Athearn. Moderator Pat Gregory then read out the names of West Tisbury residents who had died in the previous year. One of them was nonagenarian John Mayhew, island native, lifelong town resident, and World War II vet. Mr. Mayhew’s last public appearance was on Veterans Day, at the rededication of the Veterans Memorial after its relocation to Town Hall from the triangle intersection of State Road and the Edgartown Road. 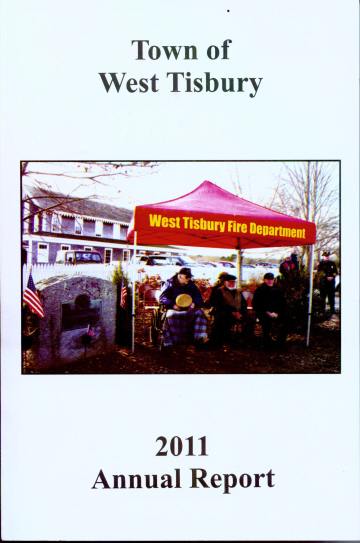 A photo of the event graced the cover of the 2011 Annual Report. Next on the agenda were reports of several boards and committees. Only a few reports were given orally; detailed accounts of the year just passed appear in the Annual Report. But a listener can’t help marveling at how many people are involved in the workings of this small town, many of them as volunteers. For the elected officials who do receive a stipend, the money doesn’t come close to compensating them for the time they put in — which is why so many of them are either retired or not encumbered by growing children. Bruce Stone, town accountant, talks about debt service. Behind him is moderator Pat Gregory. The array of subjects covered is daunting, and so is the expertise that my fellow citizens bring to and develop while doing the town’s business. A stellar example of volunteers working over several years to make something big happen came to fruition last night: we voted overwhelmingly — 300-something to 6 — to go ahead with the renovation and expansion of the West Tisbury Free Public Library. The library trustees, the building committee, the library staff, and the library’s “friends” group have been at this for years. They applied for and won a highly competitive state grant that will cover about half the cost. 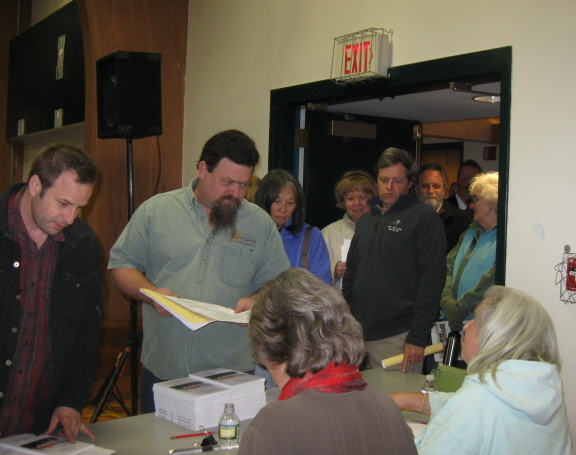 Half of the rest has been pledged by private donors, and last night town meeting voted to pay for the rest. A burst of applause, accompanied by a few hoots and hollers, greeted the vote. 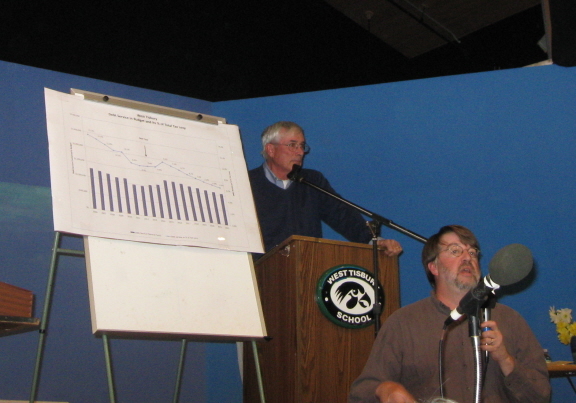 A key factor here was how hard the project’s supporters worked to let townsfolk know what was going on and solicit input from all segments of the community. Even the most attentive citizen’s attention occasionally wanders, however, and mine went seriously AWOL during the interminable discussion about proposed amendments to the town’s building code and its zoning bylaws. I’d brought my Nook: why not use this opportunity to catch up with my Scrabble games on Facebook! I logged on to the school’s wi-fi, no problem — then discovered that access to Facebook was blocked. Even for adults. Uh-oh. As an editor, I was particularly fascinated — not to mention simultaneously annoyed and bored — by the welter of amendments, amendments to amendments, withdrawals of amendments, and rescission of amendments that followed the reading of Article 15. The article was so sloppily written that its purpose wasn’t clear, and the amendments proposed before the purpose was made clear by the committee sponsoring it would have made a serious mess. Why wasn’t this unclarity caught by any of the several people who must have reviewed it before the warrant was finalized? Is there an editor in the house? Toward the end of the four-hour-long meeting, when everyone was fading fast, I was awake enough to note that Article 32, a fairly routine matter, asked the town “to Appropriate the sum of One Hundred Four Dollars ($104,400) . . .” Is there a proofreader in the house? Well, yeah: I climbed over my neighbor to reach the nearest mike and call the chair’s attention to this and it was duly corrected. This morning I learned from the Martha’s Vineyard Times that the nice neighbor I climbed over en route to the mike was the writer Geraldine Brooks. She’s Famous. As I often say, I don’t get out much. She spoke in favor of allowing dogs on Lambert’s Cove Beach, which was the next-to-last article on the long warrant. See “Dogs on the Beach” for a discussion of the issues. That post includes a link to my piece about last November’s special town meeting, at which we voted narrowly to ban dogs from the beach between June 15 and September 15. When a vote’s that close, it’s a good bet that the subject is going to come up again. When dogs are involved, it’s a sure thing. So Article 40 asked the town to rescind the ban. The ad hoc group that petitioned for the rescission wisely moved from the floor that the question be divided in two. The first asked to rescind the ban between 7 and 10 a.m. The second asked to rescind the after-hours ban, from 6:30 to 9 p.m. The group is working on a plan that will pay someone to supervise dog and dog owner behavior during the hours that dogs are allowed. They’re not sure they’ll be able to raise enough money to cover the early evening hours, which is when people who like to come picnic and watch the sunset do not like sharing their supper or their solitude with loose dogs. The morning ban was rescinded; the evening ban was left in place. I voted for both rescissions, even though Travvy and I are not beachgoers and even though I don’t have much faith in the common sense or responsibility of many of my fellow dog owners. I don’t have much faith in the Parks and Recreation Committee, either; it supervises the beach and other public recreation areas and seems all too susceptible to fearmongering and worse-case-scenario arguments. For plenty of us, “recreation” involves our dogs at least some of the time, but Parks & Rec persists in seeing us as their adversaries rather than part of their constituency. This entry was posted in Martha's Vineyard, public life and tagged dogs, Facebook, politics, town government, town meeting, West Tisbury, West Tisbury Free Public Library. Bookmark the permalink.